Bosn's Favorite Jerky! Take a few of these sticks out to sea for a high-protein snack! 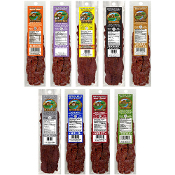 Introduced in 2005, Buffalo Bills Country Cut Beef Jerky is one of our hottest beef jerky selling products. Customers nationwide find it simply addictive. This easy to chew beef jerky is thick cut, moist and tenderlicious! Available in 9 lip smacking flavors - Barbecue, Chipotle Habanero, Double Habanero, Hickory Pepper, Honey Pepper, Mesquite, Mild, Spicy, and Teriyaki. The Spicy flavor was chosen as one of the Top 10 Spicy Beef Jerkys in the USA by Chile Pepper® Magazine. Choose your FLAVOR and HEAT below.